Our book is available for teachers, parents and paraprofessionals whose focus is Spanish literacy. You can expect to find authentically written materials in Spanish to engage your emergent readers in grades K-2. Teachers use this book as a supplement to their existing Reading Curriculum. Each lesson provides an explanation in Spanish. Why is this important? New teachers will benefit from having the academic language provided, so they feel better prepared to teach these important literacy topics. Experienced teachers will benefit as well when discussions arise around terminology and creating consistent language for students in their programs (“Do you call a noun a ‘sustantivo’ or a ‘nombre’?). Spanish-speaking parents and paraprofessionals have enjoyed the user-friendly nature of the book which bolsters confidence when working with early readers. The last page of the book contains a grading sheet which can be used as a tool of communication between paraprofessionals and teachers, between teachers and parents and even between teachers and students as students set personal reading goals throughout the year. As you can see, this is more than simply a workbook. It serves as teacher support, as a communication tool and the activities provide visuals and word lists teachers can use to develop speaking and listening skills around the various topics of Phonics, Grammar and Reading Comprehension, all in Spanish. Please do not hesitate to email Sara Knigge at sara@readenespanol.com if you have any questions on how our book will fit into your current curriculum. Click on the book image to see the table of contents, sample lessons and customer reviews. Over 50 Lessons related to Spanish Phonics, Grammar and Reading are found all in this one book! 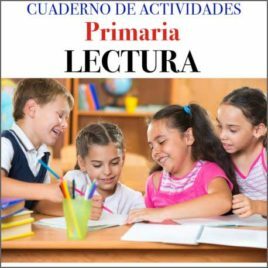 Concise explanations written in Spanish for each lesson are included so that students can benefit from common language being used by all teachers. This book can also be used as a guide for teachers to follow the process of Spanish literacy development which differs from that of English literacy development. As teachers log student progress on the grading sheet, they can better track student progress and provide them with more opportunities for practice when needed. Pack of ten (10) copies of Cuaderno de Actividades Primaria - Spanish Reading Workbook Over 50 Lessons related to Spanish Phonics, Grammar and Reading are found all in this one book! Concise explanations written in Spanish for each lesson are included so that students can benefit from common language being used by all teachers. This book can also be used as a guide for teachers to follow the process of Spanish literacy development which differs from that of English literacy development. As teachers log student progress on the grading sheet, they can better track student progress and provide them with more opportunities for practice when needed.